Yesterday was a day of running around collecting wedding things, and picking up people from the airport. My best friend is finally here. I cannot begin to say how exciting this is...she is in Germany so not only do I rarely get to see her, but it is also hard just to squeeze in a phone conversation. For weeks now I have been wanting to try something I have read about...Coconut water. I have heard it is the perfect hangover cure, the best post-workout refresher, and over all healthy antioxidant packed drink. So far I have only seen variations of coconut water with fruit flavors. For the first time I was determined to have just plain ole 100% coconut water. It is always when you are least expecting something that it finds you. This was the case with this coconut water. I just happened to be in this little store and low and behold they had 6 different flavors including plain. I couldn't help but buy it up right away. The bonus was that as busy as I was, I thought I could really reap the benefits of this supposed miracle drink. There are only 60 calories per box so it is not even bad for you. It was tasted like semi sweet water with a hint of coconut. I don't think I could have one say at every meal but it was a nice change from just regular water which is my stable drink. I cannot say that I have extra energy, better skin, or sharper brain powers but it was a nice treat. I hope to have more soon if I can ever find it again. Tomorrow brings one more work trip before the wedding and a nice long vacation. I am seriously counting down the hours. Being in Maine means wedding mode has finally become reality. Looks yummy huh? This little rustic pie is quite easy to make but for some reason I have yet to attempt it myself. I leave this little task to my mom. Each and every time this master piece is what is created. 2. Add sliced summer squash and shallots to saute pan and stir occasionally. You want them to just start to soften. 3. Roll out pie crust on parchment paper. Slide on cookie sheet. Add a layer of 2/3 Gorgonzola cheese. 4. Add cooked summer squash on top of cheese. Add sliced tomatoes, and then remaining cheese. 5. Carefully fold up edges of pie crust around the veggies. 6. Brush visible pie crust with egg wash.
7. Bake for 30-40 minutes. Add a layer of Gorgonzola cheese to a rolled out store bought pie crust. Step one of rolling out pie crust on parchment paper then slide onto cookie sheet. Add sliced zucchini to saute pan with olive oil, salt and pepper and cook until just starting to be tender. They will continue to cook in the oven when baking pie so you don't want this step to be too long. Add cooked zucchini to pie crust. Lay on sliced tomatoes. This had a mixture of grape tomatoes and leftover bruschetta mixture. Then you are done. It is great in the winter cause the out of season tomatoes bake nicely and the flavor comes out through the cooking. It is quite lovely in the summer too with all of the fresh flavors. Back in Maine. One more stop for work and then it is all wedding from here on out. My maid of honor comes today as well. What a big day! Let the fun begin. I had a lovely lunch yesterday in a bakery in Brunswick, Maine called Wild Oats. One of the things I like most about traveling for work is finding and enjoying really good food places across the country. No matter who you meet and speak to, you can always get on the topic of food. Everyone has there own opinions about what is good, and what isn't. Most of the time though the recommendations we get are pretty good. I had actually been to Wild Oats before I started going to Bowdoin College for work. It is right on Main street. They have a wide variety of granola, soups, sandwiches, breads, and sweet bake goods. Each thing I have ever tried has been delicious. My Almond Joy bar. It was so delicious and I couldn't help getting a sweet treat at a place where every time you turned around another delicious smelling snack was calling your name. I had a open face veggie melt on Anadama bread. There was boursin and provolone cheese and lots of veggies. Perfect for a somewhat cloudy cool day. Wild Oats turkey club on Anadama. A huge sandwich! I only wish I could have gotten more pictures of the baked good cases. They have about 20 different varieties of bars, and 20 more different types of cookies. So good! Saturday we had bunches of errands to run in Milford, CT. I had heard that this past weekend was the oyster festival on the Milford green. Jordan likes oysters so I thought this might be a fun distraction for a bit amidst the packing and wedding preparations. We took a 10 minute shuttle on a school bus from the mall to the green. Boy school buses are tiny once you grow up. We arrived to find lots and lots of craft tables and non-profit organizations set up. We walked and walked and started to wonder if we were ever going to see any oysters. After a quick stop at the information booth we found this tent. However there were two lines to get into the tent to order both about 50 people deep. After waiting about 5 minutes and not moving a inch we decided we had had enough. No oysters for us. The most exciting part of the whole experience was the bus ride. And the view of seeing a boy roll a blunt in the car next to us at a red light. In more so was the 50 year old business man calling it a "Fatty". Beets, beets, beets. So my parents gave me some fresh beets the other weekend from a friend of theirs that grows them in their garden. I really, really needed to use them as they were now not really garden fresh beets. Beets are not something I use or eat on a regular basis but I cannot say that it for any real reason. It’s not that I don’t like the taste of them. I just don’t eat them that often. After getting these beets I had a hard time trying to decide what to make with them. Coincidentally, another blog I read fairly frequently started posting recipes with beets including a cupcake recipe. I was quite intrigued but I really didn’t need cupcakes in my apartment just waiting to be eaten. They also posted a goat cheese and beet Panini that sounded good to me but I didn’t think there was any way I would be able to convince Jordan to eat. I had a lot of suggestions for borscht. I just don’t know about this. I kind of feel like with the red color it would be like sucking down blood; although I love the Twilight series I do not need to replicate the feeding habits of vampires. Finally, I settled on something fairly simple. They were so red and dyed my fingers bright pink! The picture came out like a witches brew! Super steamy beets. I basically just boiled the slices for about 10 minutes. They were soft but still crispy and firm. I drained the water and then seasoned with salt and pepper and some balsamic vinaigrette. They were a good side with a salad for lunch. One warning: I tried to add some of the leftovers to a smoothie. This was absolutely no good. The drink itself was very pretty and pink. The taste was not so bad. However, the texture was so gross and grainy. I couldn't mouth more than 1/2 a glass and the rest went into the trash. Not to get my hopes up or anything but that looks like a fine week there! I am trying to live in the moment right now. I don't want to miss anything as the wedding day fast approaches. I am finding this rather difficult though. I am still at work, living in the moment at work is just not all of that fun right now. Both of my parents are off to Iowa for the week to visit my brother, and his wife in Iowa. They are having all sorts of fun. This fun is with out me and right now that is where I want to be. Last night I was watching Anthony Bourdain in Rome. I wanted to be in Rome. The sounds of Italian is so pretty. I have no idea what they are saying but it is music to my ears. Then there is the food. He was eating these amazing pasta dishes, sampling cheese and wine. I was starving at 10pm last night. I wanted to go to Italy. I also want to be in Maine. The wedding is 9 days away. That is so very close but feels very out reach. I am still in Connecticut. I still have a long list of things to organize and get prepared for the trip to Maine. My family is not even there yet. It just hasn't it me. I need to be in Maine. As life continues to tick by this week, living in the moment is so very very hard. Ah, last night was girl's night. What a fun time! I am all excited when I get home. Then I cannot go to sleep so I keep Jordan up. We both pass out to sleep and wake up late. I hope this day isn't too hard to get through. Either way girls' night is well worth it. Plus tonight is the first night all week that I do not have errands or appointments to get done. How is it Thursday already? 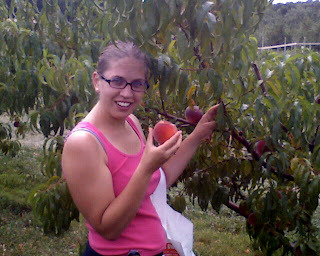 Somewhere in the madness of the weekend Jordan and I went fruit picking at Bishop's Orchard. I will say it is like 5 minutes down the road, quite conveniently close and peaches and pears can be picked so much faster than blueberries. We definitely snacked on some fruit while we were there and it was so sweet and juicy. I only wish I had time to go back and get more. Not only to eat but to make yummy to desserts. Peach cobbler anyone? It's 10 big days till the BIG day. Hooray! This is Jordan and I after one long Saturday. The weather was phenomenal this weekend. Sunny, warm but not too hot. It was a great time to be outside. Boy, was I outside a lot. It as great till I saw the tan lines. But I won't talk about that now, let's just say the beauty plan is not working out as easily as I had hope. I am having fun though so I am not going to complain. Saturday afternoon we went to a BB&Q at some friends' house. It was a lovely time. There were lots of good people, cute doggies and fun games. Oh and I forgot the massive amounts of great food and good drink! I really slacked with the picture taking till a bit too late. Everyone had already devoured most of the food and started in on the deserts before I got around to taking any pictures. Needless to say it was so delicious it went really fast! My contribution was black bean and corn salad. This was a first time recipe and it looked good. It turned out amazing and I was so happy. I will say it looked a lot better at the beginning of the night when the bowl was full. I took the leftovers last night and made Mexican pizzas. It was by far the best Mexican pizzas Jordan and I have had. Each time we vary it up a little but these were amazing. It was a yummy quick meal before we headed out and about for wedding stuff. It seems these days the only time Jordan and I have together to relax are meal times. I like beans. I am not a bean fanatic. There has to be a right proportion of other foods to beans ratio for me to really enjoy a bean dish. Too many beans are just no good. The dry mushiness in your mouth gets gross I think. However, if this ratio is met I tend to love bean dishes. Lately I have been really into black beans. We have some variation of Mexican meals at least once a week. I don’t think Jordan enjoys these meals with the same intensity as I do but we make do. Anyhow, while eating out recently have been partaking in lots of black bean salads. If you think about it I would assume they are fairly simple to make and the ingredients are quite inexpensive. So I set out on a mission to find a good black bean salad. My search led me to the trusty food network site and this recipe by Guy Fieri. Woah it's fun to be girly sometimes. I have found myself most girly at bridal showers. I think that this is actually fairly normal and so I am not too embarrassed to show this picture. My lovely co-workers decided to throw me a lovely bridal brunch/shower on Saturday morning. The above picture is an adorable apron and set of cleaning gloves. They make housework very fashionable. Not saying I wasn't fashionable before but most of the time my cleaning attired is not so classy. Among other things I got a few kitchen gadgets. I love the potato masher. I have so many ideas for things to mash! Check out the spread of yummy breakfast items. We had a variety of tea and coffee, plus OJ and strawberry juice for mimosas. Quite the refresher for a sunny day. There was fruit and bagels, cherry chocolate scones and banana muffins. They are Kari's recipes and maybe if she is feeling nice we will get to someday have those recipes. By the end of the party they were gone! Thanks so much girls! I had an awesome time. Oh boy, its Friday! I am so excited for the weekend to be so close. This weekend is full of many fun activities, some wedding plans and events, other just normal summer entertainment. I woke up early to find it 66 degrees outside. Last night was the first time since way before we moved that we turned the A/C off. It was nice to just have natural air and peacefulness of the bugs and insects humming outside. No birds though, thank goodness there were no birds. I had a yummy smoothie in a bowl for breakfast. I made the rookie mistake of putting some bitter lettuce pieces in the smoothie. It was still good. I sprinkled a bit of homemade corn muffins for a topping. Hotel breakfasts are good but you cannot get something like this in a hotel. It's a great way to start off the day. A day that will end with the weekend! I cannot wait. I have a secret I really want to share. I would like to think I am good at keeping secrets. At least other people's secrets. I am not so good about my own secrets. When I have something I want to share but probably shouldn't I have trouble. I am in that spot right now. I have something I really want to share but I am going to try really hard not too. This is my outlet. I am sorry to intrigue and still not share. Sooner or later though I think I will let it slip. Tonight was a busy night. We were gone from as soon as work was over till way past our bedtime. We even missed Big Brother. Sorry for the lack of pictures and food topics lately but that is life nowadays. I am very much in the mood to cook this weekend though. Beware lots of recipes to come! Finally back to Connecticut. Life continues again and I have beets. Any suggestions for what to do with Beets? I am on the longest work trip I have to take by car. All of the way up to St. Lawrence. According to Mapquest the time I get back to Connecticut tomorrow I would have been in a car for 15 some hours in the last three days. I hate driving and that is a lot of driving. Tonight finds me in Syracuse. Oh Syracuse, I think it ranks somewhere in the middle for good and bad places to travel. I rank places to travel based on transportation method, food around the institution and hotel, and the accommodations. Transportation here is by car, when I am driving this is a big negative thus this trip it lowers the score. The Hampton here is middle ground. Last night we stayed in a brand new Hampton Inn in Watertown, NY. Accommodations were great but the food not so much. In Syracuse the hotel is situated right next to two very good restaurants. An Italian and a steakhouse. We picked the Steakhouse, Justin's Grille. I have eaten here a couple of times but only with take-out. This was my first dine in experience. Well, the service was terrible and I will never go back. Thank goodness the food was delicious. The last thing you want to deal with when traveling for work is waiting for your food for over 30 minutes. When we asked what was up the waiter just blamed the kitchen and the process of putting the order in. This was after we watched him flirt with the hostess most of the night. Arg! I really hate bad service. It would be hard for me to recommend a place after such an experience but the food really is delicious. I was planning on taking pictures but forgot the camera. The point the food finally arrived though I was not in the food to take pictures. This is Sunday's dinner - stuffed peppers. It is one of those meals I always forget about making and then when I do I am so happy. It was good and comforting. Two dinners in a row at home, this could be a record. The big mission last night is to kill the damn bees. Actually we have determined they are Yellow Jackets. Mean nasty little yellow jackets that hunt me now every time I try to leave the apartment. The night I posted about the bee sting I received last Sunday Jordan got stung. He saw the sucker and it was a big yellow jacket. He of course being the man he is didn't cry as much as me, or even at all which he was sure to point out, but that is beside the point. Sunday at 2pm I went to leave to get great poisonous spray to kill the yellow jackets. The problem was I had to walk by the hole in the ground where they fly in and out of. They were flying in and out so fast, lots and lots of yellow jackets. After about 5 minutes of debating if I really was going to make it out and all of the alternative routes to my car (there are none), Jordan can to my rescue. I suited up in a long sleeve coat and Jordan swiftly escorted me through the storm. We had to wait until evening when they calm down a bit for Jordan to go out and spray the hole. The initial idea was to suit him up in ski gear in case they attacked. Jordan being the man he is decided he didn't need protection. I thought this was crazy but I think we hit the yellow jacket bedtime as there was very little activity flying around. For the record though I still would not have done it without protection. Jordan sprayed the hole for a good long time and shot at any yellow jackets that attempted to fly in or out. He didn't get stung once, yea! He used half the spray can. This morning I took a turn spraying the hole for a bit when I left cause I saw a baby one flying around. Jordan also finished off the bottle when he noticed two more before he left. Happily I can say that at lunch and tonight Jordan didn't see any. Thank goodness cause the situation went for nothing to bad to impossible in about a week. I don't think I could have taken another day of being petrified of leaving the apartment. Last week ended up being a big week for eating out it seems. Wednesday was pizza night. Thursday was take-out at a new Thai place across the street from our apartment. Friday night I met my mom in Boston and ate dinner out. Saturday at lunch we dined at Stephanie's on Newbury. The website said it was is a Boston establishment. I don't know about that but they certainly had a good lunch. I had a grilled shrimp quesadilla and my mom had a grilled shrimp salad. We shared. It was a gorgeous day out and we did lots and lots of wedding organization. Lucky for me Jordan had a nice and lovely meal waiting for me Saturday night at dinner time. This week has been somewhat hectic, somewhat normal. Work has definitely picked up. My calendar at work is color coded and right now it is one big rainbow of appointments, meetings, and reminders. The dreaded blue color is all over the place. Blue = travel. This week I will make the long trip to St. Lawrence. That is almost in Canada. I will swing back round through Syracuse before heading back. 3 days on the road with 3 days of limited workouts and lots of eating out. I did not plan this out well. 2. Whiten teeth with strips from drug store. Hum….this does not sound like fun. 3. Get final hair cut. 4. Do not bruise myself – I have become a complete clumsy fool and have bruises all over my legs. 5. Do not break any nails – eat jello? 6. Do 15 push ups and 100 sit-ups every day- this is me not doing Jillian 30-day shred DVD. I feel like I have a long history with Bethenny. Way back in my college days I watched The Apprentice "Martha Stewart" version. I like Martha Stewart. I marvel at her craft skills, all of which I do no posses. And I love her cooking tips and recipes. Back in middle school I watched her show on school vacations and one year I even subscribed to her magazine. Anyway, when her Apprentice came out I made it a point to watch. One of the contestants was my favorite. That contestant was Bethenny. Soon college life got in the way of my TV watching and I was never really sure out the competition ended. I have since heard that she was the runner-up, don't quote me on that though. Years later she showed up on the Housewives of New York series on Bravo. I was never really "into" this series but I have watched some episode here and there. I never really understood how Bethenny was considered a Housewife since she was not married and had no children. She was however, very entertaining to watch with her witty comments. Again fast forward a few years, many more Housewives series have come out. Bethenny published many "skinny girl" books and branding things, and she started doing magazine articles and Today show appearances. Here I was following it all along. Then BAMB! She got a new series called Bethenny getting married? Now here I am getting married and I had to see this show. Granted it is on super late on Tuesday nights, so I watch it OnDemand on my own time. for about two episodes she was majorly freaking out about wedding plans. Granted she was 6 months pregnant too but I felt like she was living my life. Then I would get mad cause she had a high priced wedding planner and was still stressed. I do not. Anyway the show is a hoot to watch. Now she has the baby so we will see how I relate now. Tuesday, oh Tuesday. Last night Jordan and I were in our groove again, at least a semi-manic version of my groove. Jordan doesn't seem to know the sense of urgency so I guess we could say that we balanced each other out. After work I took off for the gym and Jordan was left to prepare dinner. Based on dinner plans for the rest of the week and the available ingredients he found this recipe online. 1.Heat oil in a large skillet over medium high heat. Add garlic and saute until aromatic oils are released, then add chicken and cook through until no longer pink. 2.Stir in tomatoes and basil and bring to a boil; reduce heat to low and simmer for another 3 to 5 minutes. Finally, stir in steamed beans and serve. 3. Cook pasta according to directions on box. Combine with chicken mix. This was one of the recipes where the reviews were right on par. Sadly, the reviews weren't all that great. The flavor was barely there so the whole dish was somewhat bland, even with the fresh basil. It was OK, but needs a bit more tweaking to be great. We paired it with some pasta to add some carbs to the meal. I hate bees. I really do not like them. I would wish them to all die but sadly they have an essential job to do on this earth. 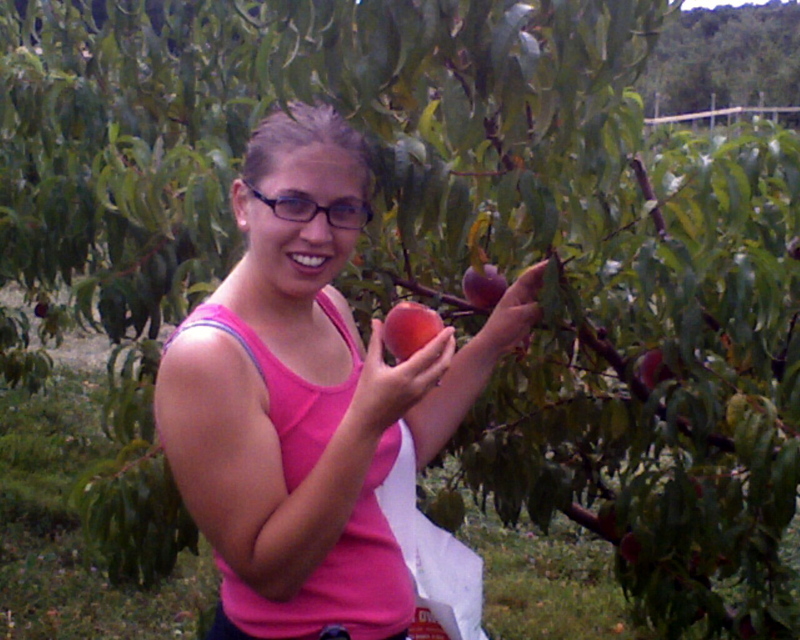 They pollinate all of the wonderful flowers and veggies and fruit that I so love. Thus, I cannot wish them to die but I do hate them. This weekend I was in Maine. It was a lovely weekend. We left in time to miss the toll booth traffic. My mom packed us a delicious lunch so we didn't have to worry about stopping for yucky road food. I was all organized with a list of things to do to get ready for the week. Then we got home. I had my first arm's load of things to bring upstairs and about 5 feet from the door I felt mind-numbing pain go into my toe. What do you ask might this be? Well a stupid bee stung me. I have a pretty high tolerance for pain but bee stings I do not. I was immediately bent over and in tears. I hobbled up the steps and landed on the couch. You might think this is a bit of an overreaction but it wasn't. I am hyper-sensitive to bug bites. You should see me. Basically I didn't know what to do with my foot. It was still very painful and my poor little toe had doubled in size. I of course called my mom for a plan of action. The rest of the Sunday though was a loss. No errands for me, no running, no wedding list plans. I HATE bees! Hence box mix brownies and no joke they really made me feel better. How can you think of pain when you have a nice plump brownie to eat. Sometimes I think of what I am going to blog well in advance of me actually blogging. The original thought was I would have a nice greeting of good morning! But oh look at the time and the day is 1/2 over. Jordan had a good friend from college getting married this past weekend and we went up for the wedding in Rangely, Maine. Conveniently we got some of our wedding planning done as well. The big marriage license was filled out and paid for. I guess this really makes it official? Each morning I woke up to 53 degree weather. It was freezing. I grabbed one last minute sweater before we left thank goodness. I think I wore it for a good portion of each day. It was the essential Maine summer weather. The wedding was a great time and absolutely beautiful. It was one of those times when you see people you haven't seen in such a long time. It was wonderful just to touch base again. There are so many memories. We really need to try and make more of in effort to see people on a regular basis. The muffin above was the breakfast at the Inn we stayed at. It was a Morning Glory. I always thought this was a funny name for a muffin. If it was a cookie they are normally called the Everything cookie but for a muffin its Morning Glory. Regardless of the name I always enjoy the catch-all of anything so the Morning Glory muffin is right up my alley. I might be tempted to try out a few recipes later this week. Last night the only energy I had went towards a boxed brownie mix.